Montréal, March 27, 2018 – Quebec Iron Ore Inc. (“QIO”), a Champion Iron Limited (ASX:CIA) (TSX:CIA) (“Champion” or the “Company”) subsidiary, is pleased to announce that preparation for the first shipment of Bloom Lake Iron Ore Mine (“Bloom Lake”) high quality iron ore is underway following the arrival of the MV Magnus Oldendorff at the Port of Sept-Îles on March 25, 2018. 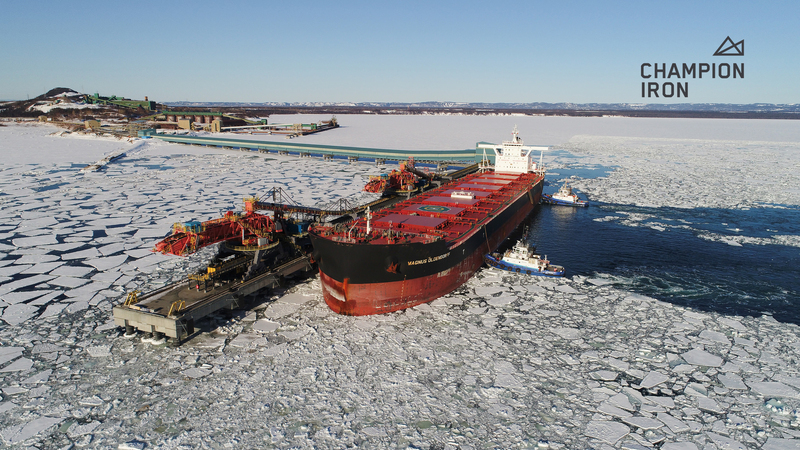 The first shipment to Asia will comprise up to 200,000 wet metric tonnes of high-grade 66% Fe iron concentrate, part of the tonnage transported by rail to the port over the last month from QIO’s Bloom Lake mine located near Fermont, Quebec. The loading of the MV Magnus Oldendorff (pictured) at the Pointe-Noire terminal completes a historic milestone for the Company and the Port of Sept-Îles as it represents the first vessel loading at the brand new terminal and also marks the inauguration of the new conveyor linking the stockyard to the new terminal. For the Company, this first shipment demonstrates QIO’s ability to deliver high quality product to global markets. As part of this capability, in addition to owning specialised railcars for the transportation of iron ore, Bloom Lake has access to a fully operational rail loop on-site as well as access to substantial and modern rail and port storage and handling infrastructure between Fermont and Pointe-Noire. The successful delivery of iron ore concentrate to the port this month, and the subsequent first shipment of the product to Asia, highlights QIO’s efficient logistics strategy and confirms Bloom Lake’s potential to become a major supplier of high quality iron ore to global markets. “The first vessel is being loaded almost one month ahead of our original schedule with a high quality iron ore product fully in line with specifications and with our pilot plant test work. This is evidence of the professionalism of all employees involved and the hard work of our stakeholders, as well as of the world class potential of the project”, stated Executive Chairman and CEO of QIO and Champion, Michael O’Keeffe. Mr O’Keeffe further commented that the 200,000wmt shipment to Asia of the Bloom Lake high-grade iron concentrate is being completed at a time where current iron ore prices of US$71 pmt for 62% Fe are 25% higher than the estimates of US$56 pmt used by the Company in its original planning. The first shipment is a positive start for a mine that is forecast to generate more than CAD15.1 billion in revenue over the next 20 years, underlining Bloom Lake’s potential to be one of the region’s leading long-life iron ore mines and a major contributor to both the Quebec and Canadian economies. The QIO logistics strategy ensures long-term access to some of the world’s largest consumers of iron ore for Bloom Lake’s high-quality product. The decision to restart production at the Boom Lake Mine was announced on November 15, 2017, and operations recommenced at the plant on February 16, 2018, ahead of schedule and within budget. With a CAPEX of CAD 326.8 million, including CAD 157.2 million spent on upgrades ahead of the mine restart, Bloom Lake is a large-scale project which is set to bring about a new era of prosperity to Quebec’s North Shore region. Champion is an iron development and exploration company, focused on developing its significant iron resources in the south end of the Labrador Trough in the province of Québec. Following the acquisition of its flagship asset, the Bloom Lake iron ore property, the Company implemented upgrades to the mine and processing infrastructure and has partnered in projects associated with improving access to global iron markets, including rail and port infrastructure initiatives with government and other key industry and community stakeholders. Champion’s management team includes professionals with mine development and operations expertise, who also have vast experience from geotechnical work to green field development, brown field management including logistics development and financing of all stages in the mining industry. For additional information on Champion Iron Limited, please visit our website.